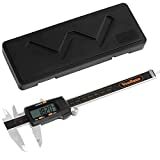 Digital Caliper, Preciva Electronic Vernier Caliper Gauge LCD Screen IP54 waterproof 150mm 0-6"
Contractors, engineers, huntsmen, mechanics, and numerous others utilize precision measuring tools every single day. Calipers are specialized measuring tools that measure distance, depth, thickness, internal and external diameter, and more. 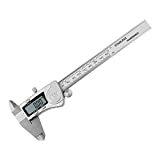 The quest for more accuracy, reliability, and ease of measurement has been advanced by the advent of digital calipers. If you are looking to increase your measuring efficiency and repeatability, look no further than this buying guide to learn more about the latest innovation in measurement – the digital caliper – and determine which model is right for you. 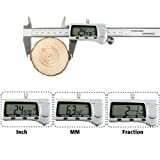 Vernier Calipers: Vernier calipers have sliding scales on the top and bottom that show both imperial and metric measurements simultaneously. They are able to measure outside and inside diameters and typically can also measure depth. Dial Calipers: Dial calipers indicate measurements with an indicator needle. The measurement on the dial is combined with the reading on the scale, which runs along the caliper’s beam. Dial calipers take outside and inside measurements, step measurements, and depth measurements. 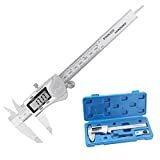 Digital Calipers: Digital calipers – the focus of this buying guide – are the most modern type of caliper. Unlike the original rack and pinion mechanism system, digital calipers use an internal microprocessor that calculates the position of the jaws and shows the reading in a display widow. Jenny Calipers: Jenny Calipers, or odd leg calipers, are used to draw lines that are a set distance from the edge of a work piece. They are also used to locate the center of a work piece, much like a compass used in geometry. Spring Joint Calipers: Spring joint calipers are made of two legs, a spring, and an adjustable nut. Because they do not have a graduation scale, they must be used in conjunction with another measuring tool. They are used to take inside and outside measurements. Micrometers: Micrometers are used to measure tiny distances, typically around 1/1000mm. They can measure thickness of blocks, outer and inner diameters of shafts, and depths of slots. Repeatable readings: What may seem like a given when purchasing a tool designed for extremely precise measurements was, in fact, the number one most highly-rated characteristic of the best selling digital calipers. Review after review lauded their new calipers for their ability to measure the same thing over and over, providing the exact same precise measurement. Reviewers noted that cheaply made calipers often do not provide stable readings, reading the same distance differently each time it is measured. Remembers zero point: Reviewers sang the highest praise of digital calipers that were able to maintain an absolute zero. The ability to measure as many distances as needed without having to reset to zero was considered a major game changer. 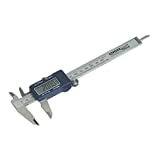 Some of the top-rated digital calipers even included a function to measure relative distances without losing the absolute zero. Smooth action: The majority of 5-star reviews took note of the incredibly smooth action they experienced when using their digital caliper. Reviewers said that smooth adjustment of the jaws along the bar made a significant difference in the ease and speed of using their digital caliper. Solid construction: Top rated calipers were recognized continually for their solid construction. Users identified straight jaws, tight linear carriage, absence of play in machinery, and lack of sharp edges as indicative of a high-quality tool. These features were key contributing factors to excellent reviews. 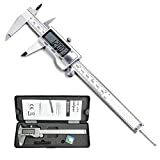 Price: Calipers come in a wide range of prices. Many reviews identify more inexpensive calipers that are comparable to calipers two or three times their price. 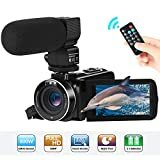 However, it is often true that you get what you pay for and if you are looking for extreme precision that is repeatable and reliable, it may be worth it to save up for a more expensive model. Ease: Some digital calipers feel more effortless to use than others. When determining which digital caliper is right for you, look over what reviewers have to say about simplicity of use. Look for indications that jaw movement is smooth, thumb wheels are sensitive, and displays are easy to read. In addition, digital calipers with extra functions and features may be more complicated to figure out than others. Construction: Digital calipers can have significant differences in construction. Look over specifications and reviews regarding dimensions, weight, and sturdiness of each caliper. Although weight tends to be indicative of quality in tools, some people may prefer a lighter tool if they will be keeping it on hand throughout an entire day. 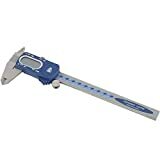 Relative zero: If you intend to compare measurements frequently, it would be helpful to purchase a caliper with a relative zero function. This way you can quickly and easily compare distances. Decimal size: Some people prefer to see their measurement displayed more specifically than others. 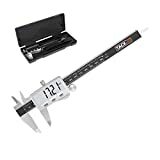 If you are looking to adjust the accuracy of your result according to the number of decimal places, look for a caliper that allows adjustments to be made to the display settings. 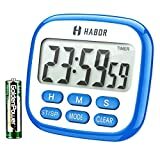 Battery life: Some people prefer to purchase digital calipers with an “auto-off” function so as to avoid battery waste. This is a completely optional feature. However, if you tend to be forgetful or are worried about maintaining long battery life, look for calipers that include an auto-off feature. Mitutoyo: Mitutoyo was established in the late 1990s and continues today in the hands of a group of highly skilled engineers with advanced knowledge of metrology. Mitutoyo produces and designs high-quality measurement systems. iGaging: iGaging USA Precision Engineering was founded over 15 years ago. It is a division of International Precision Instruments Corporation, one of the largest measuring tool manufacturers in the world. iGaging develops precision measuring tools for industrial and hardware markets and aims to provide accurate, reliable measuring tools for professionals who need them in their daily lives. Neiko: Neiko Tools USA is a leading manufacturer of quality tools and supplies. Neiko offers a wide range of professional grade tools for home improvement, auto repair, and contractor applications. Hornady: Hornady was founded in 1949 as a world-leading innovator of bullet, ammunition, and reloading tools and accessories.